Concord Films qualify for the 2009-2010 Energy Tax Credit. This series of pages will help you determine which films qualify in your part of the country and for your type of windows. At the bottom of this page are two important links to obtain the necessary documents (IRS Form 5695-2009 and Concord's Manufacturer Certification). The following information is designed to assist you in identifying which Concord Film(s) are eligible based upon your location and the type of glass you have installed in your home. There are total of three (3) variables in determining your eligibility under the Residential Energy Efficient Property Tax Credit. #2 The type of windows you have in your home (not all windows qualify in all zones - more on that later). Let's Get Started. 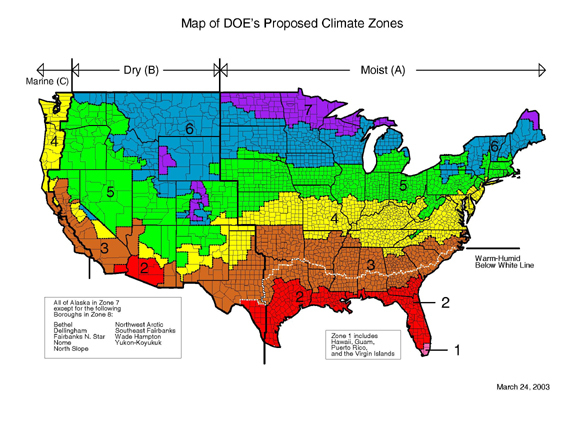 Take a look at the map (below) and determine which Zone you are located in. Need help determining your zone?